Two bedroom apartments in the most modern and new project in Cyprus: Limassol Marina. Apartments are fully equipped for your stay. 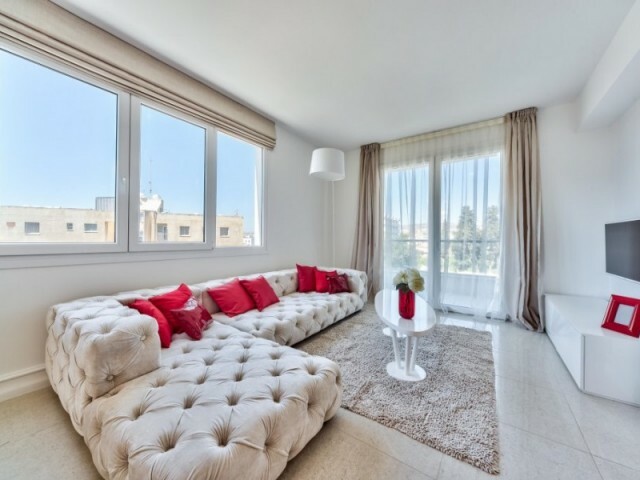 In walking distance of all the necessary infrastructure: boutiques, pharmacies, shops, cafes and restaurants, bakeri..
Two bedroom apartments in Limassol, close to the area of Neapolis. The apartments are located 30 meters from the sea, in a complex with swimming pool, barbecue area, parking and concierge service, free Wi-Fi, a gym, two bedrooms, three bathrooms, ..
Apartments in Limassol, with one bedroom, 350 meters from the sea. The apartment is located on the third floor, with a balcony off the stunning views of the sea, the mountains and the city of Limassol. Great location, next to a supermarket, cafes .. The complex is located 700 m from the sea, swimming pool, tennis court, landscaped green area. Near the complex are non-stop shop Sigma, Russian food store Slavyanka, pharmacy, cafes and restaurants. The apartment - living room with open-plan kitc..
2-bedroom apartments (total area of ​​90 square meters with 2 bedrooms, large lounge, kitchen, 2 toilets, bathroom, large terrace), located in a new building on the second line from the sea in the 1-2 minute stroll to the beach one of the most pre.. Apartment in Neapolis with 3 bedrooms. The apartment is in excellent condition, renovated. Shops near the apartments Alfa Mega and Debenhams, a gym and a 5-minute walk from the sea. The apartment is fully furnished with modern furniture. Open-plan..
3 bedroom fully furnished luxury apartment in a prestigious complex 41. Located in a convenient location of the tourist zone, on the first line, 20 meters from the beach - near the hotel Crusader, and not far from the hotel Atlantica Miramare and .. The apartments are located in a quiet area near the hotel Atlantica Bay. Only 300 m from the sea. In walking distance to supermarket, restaurants, cafes, bus stop. In the complex: 2 swimming pools, sauna, gym, jacuzzi, playground, beautiful garden..